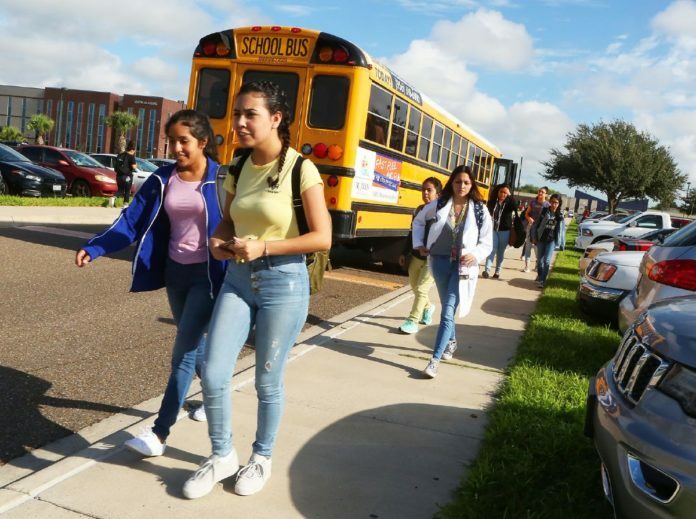 McAllen ISD Achieve Early College High School students walk from the school bus to class at the South Texas College campus on Wednesday, Sept. 19, 2018, in McAllen. McALLEN — They went from an all-portable campus at South Texas College to their first brick and mortar classrooms. Students and staff at Achieve Early College Campus are all moved into what school district officials are now referring to the Lincoln-Achieve campus. The entire Achieve Early College High School cohort, which is currently at 491 students, began their school year at the former Lincoln Middle School campus, marking the first time that these students, teachers and staff are housed a traditional campus. The district held a formal ribbon cutting celebration this week at the new Achieve campus, which McAllen Superintendent Jose Gonzalez said was well attended. Students at Achieve slowly begin taking classes at the STC campus after their freshman year. Once they enter the 10th grade they are allowed to take one or two classes at STC, while 11th and 12th graders take most of their six to seven classes at the junior college except for a few English, math or science classes at the high school. The daily commute between portables was safe, Carmona said, but it would also result in staff not being able to have eyes on a lot of students. Now the students’ main gathering area is the former Lincoln campus, which is located across the street adjacent to STC, and they then get bussed to and from the campus using buses that run every 10 minutes. One of the biggest needs at Achieve was to find a more secure location that could protect students not only from passersby accessing the portables, but from the weather. The former campus didn’t have an indoor gym facility so any physical education exercise would be outdoors only, now they can utilize the gym for these and other activities as well as their own library. Plans for this big move were solidified in April after McAllen school district officials along with the board of trustees discussed options to address enrollment decrease and facilities’ needs throughout the entire district. The goal was to provide Achieve students and staff with a safer environment, larger classroom space and overall, all the perks that come with a campus facility, Gonzalez said. The plan constituted redrawing some district lines to move all students from Lincoln Middle School to nearby middle school campuses including De Leon, Travis and Fossum. Most teachers would follow their students to their new middle school campuses, while others would move to other schools within the district or even administration. Gonzalez reiterated throughout the entire process that this change would not result in layoffs, considering they still needed additional teachers in the other middle schools and possibly staff. On Thursday, Gonzalez confirmed there were no positions or jobs lost as a result of the transition. District officials had also discussed possibilities of renting out space to STC for evening classes if needed at the Lincoln location, but Gonzalez said these conversations have not been brought back up. Instead, he said, the college might be interested on land that is south of the new Achieve campus. However, no plans have solidified yet. Overall, he said the transition was made smooth by all of those involved, either leaving or coming into the former and renowned Lincoln Middle School location. “Part of the smooth transition was parents, teachers, students, administrators all working together to ensure that we all work as a team to make that transition smooth, so I really want to thank everybody for that,” Gonzalez said.